The tax man cometh again but before you file in your returns, look for ways to maximize your tax savings. THE time for filing tax returns is upon us again and foremost on every taxpayer’s mind now is how to pay the least tax without being penalized – or even imprisoned – for tax avoidance. So the million-dollar question is how can Malaysian taxpayers pay less tax? KPMG tax partner Pauline Tam points us to some simple moves. “Make an effort to be updated with the full list of tax exempt or partially tax exempt allowances or benefits, personal relief, deduction, rebates or tax incentives that we as individual taxpayers are entitled to. “Start to recap what you spent in 2009 and compile the receipts for purchase of books, magazines, sports equipment, computer and course fees for a degree at Masters or Doctorate level and so forth that you could have chucked away in your drawers. 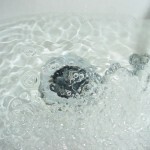 “If you have somehow forgotten what you spent in 2009, it’s never too late to start planning now for 2010,” she advises. Peter Lim, a senior manager with a multinational company, has a shoebox full of receipts, which he plans to sieve through in the coming weeks to offset against his taxable income. 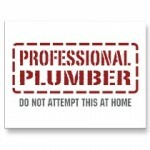 “I aim to take advantage of all the tax reliefs that I am entitled to. My taxes always result in a big hole in my pocket, as I tend to lose my receipts and are not updated on the latest incentives and reliefs. “Hopefully it will result in lower taxes for me this time especially since the Government did not introduce many new incentives for the year of assessment (Y/A) 2009,” he says. There are few changes in terms of tax incentives, reliefs and rebates for individual taxpayers for Y/A 2009 versus Y/A 2008. 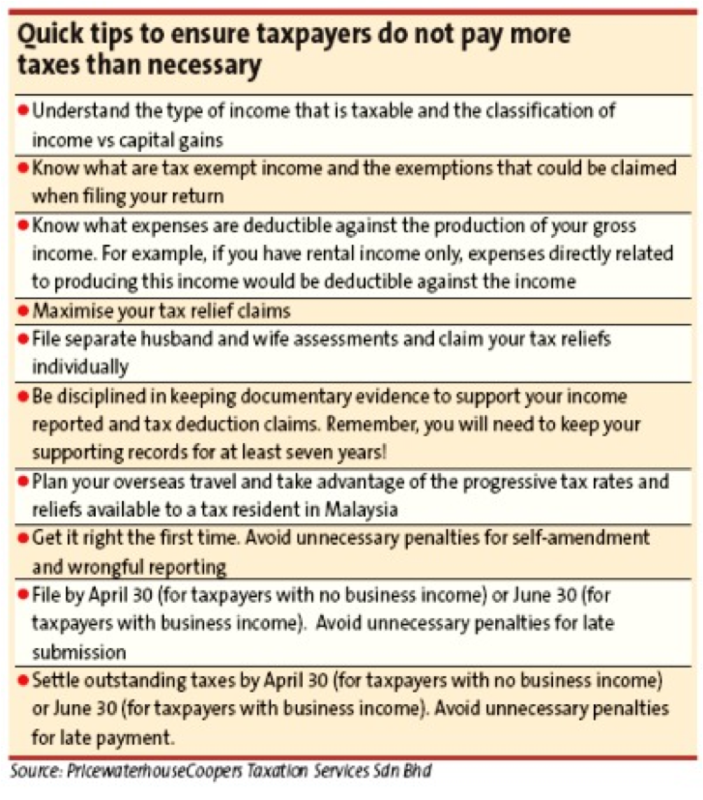 The main changes consist of the reduction of the top marginal tax rate to 27% from 28%; increase in the rebate given to individual taxpayers whose chargeable income does not exceed RM35,000, to RM400 from RM350; and tax exemption on interest income from Syariah-compliant savings bonds issued by the Government. The withholding tax rate on non-corporate investors including residents and non-residents for income from real estate investment trusts listed on Bursa Malaysia was reduced to 10% from 15%. In addition, bonus and directors’ fees are to be taxed in the year such income are received. KPMG’s Tam says employers might wish to educate their employees on the types of reliefs and tax deductions that they are entitled to, as well as the types of records that employees should maintain to substantiate the claims. “This would go a long way in assisting employees. The tax awareness program could involve either inviting Inland Revenue Board (IRB) officials or their tax agents to conduct briefings on a yearly basis or whenever there are tax changes. “The program could also include guidance on how to e-file their tax returns and to have a better understanding of their rights and obligations under the tax laws,” she adds. Employers should also consider the available tax-exempt benefits and allowances when reviewing the annual remuneration package for their employees to reduce their financial burden. However, these would have to be weighed against the additional cost and administrative tasks in implementing the benefits. PricewaterhouseCoopers Taxation Services managing consultant Hilda Liow concurs. “Malaysian employers are mostly quite receptive to employee tax incentives announced by the Government and do actively consider structuring their employees’ remuneration for tax effectiveness. “However, the usual constraint is in ensuring that there is no increase of cost to the employer in implementing a tax efficient remuneration structure,” she says. She stresses that Malaysian employers have to begin to appreciate the overall attractiveness of their employee remuneration and incentives programes as an important tool for recruiting and retaining talent. Incentives that taxpayers should look out for this year are as follows. 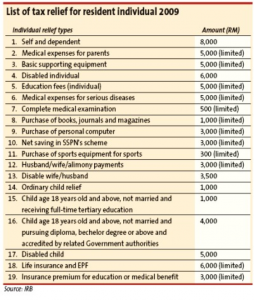 Firstly, the top tax rate on chargeable income exceeding RM100,000 is 27% for Y/A 2009, with a reduction to 26% for Y/A 2010. Secondly, personal relief will be increased from RM8,000 to RM9,000. In addition, there are new tax reliefs like a tax relief of up to RM500 per year for broadband subscription fees from 2010 until 2012. 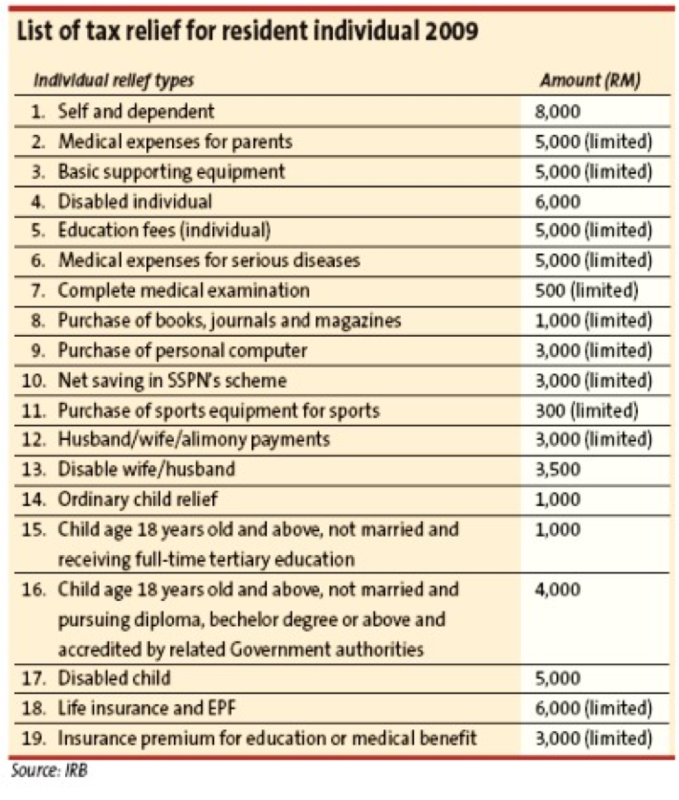 The relief for life insurance premiums/approved fund contributions would be increased to RM7,000 from RM6,000. The additional RM1,000 is given solely to annuity scheme premium from insurance companies contracted with effect from Jan 1, 2010. The Budget 2010 announcement also saw the unprecedented introduction of a flat reduced tax rate incentive on the employment income of a knowledge worker in a specified economic region (the knowledge worker, qualified activity and specified region must be approved by the Finance Minister). 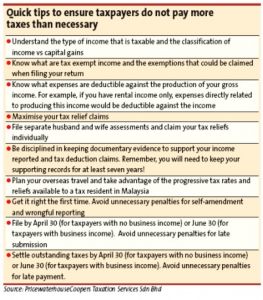 “The employment income of a Malaysian and foreign knowledge worker residing in Iskandar Malaysia and working in qualifying activities will be taxed at a flat rate of 15%,” Liow explains. However, the IRB has yet to issue guidelines on the definition of “knowledge workers” and neither has it provided clear guidelines as to the application process and the documentation to support the application with the Finance Ministry. To sustain a progressive nation, Liow says the Government would need to enhance the competitiveness of individual taxes. “There is still the 1% gap between the top personal tax rate of 26% (effective from Y/A 2010) and the corporate tax rate of 25% (effective from Y/A 2009). “An eventual harmonization of the top personal and corporate tax rates could provide a competitive advantage in attracting investment and providing greater flexibility for individuals in business to determine their business structure,” she adds. According to Liow, it is also timely for the Government to expand green tax incentives to the individual consumer especially with the continued focus on green issues and the need for countries to work together to lower their carbon footprint and reduce gas emissions. Currently, the only incentive enjoyed by an individual is the stamp duty exemption announced in Budget 2010 on the costs incurred to obtain the Green Building Index certificate by the first owner of a residential building. “More incentives for the individual taxpayer could include residential energy efficient reliefs for energy efficient households, such as the usage of solar heating systems and circulating fans as well as fuel vehicle reliefs for the usage of personal hybrid vehicles,” Liow says. Tam highlights that widening the income band in each income bracket for the respective progressive tax rates or granting more reliefs or deduction would have a substantial impact in easing the tax burden for individuals. She reckons the Government could introduce parent relief in recognition of taxpayers supporting their aged and handicapped dependants with further parent relief if the taxpayer lived with the dependant. “They can also allow taxpayers to claim the full amount of donations given to approved charitable organizations without any restriction. Currently, the deduction of donations is limited to 7% of aggregate income,” she says. In addition, Tam says, the Government could consider reinstating the deduction of interest paid to finance the acquisition of real property as part of the incidental cost to the acquisition price for computing real property gains tax payable.